This post originally appeared on Minxeats.com on September 18, 2012. When my dad and I went to The Fork & Wrench a couple of months back, the best thing I ate was the farro risotto that accompanied my fatty and under-seasoned duck breast. (Yes, I am still bitter about that. I wanted the scallops, dammit.) 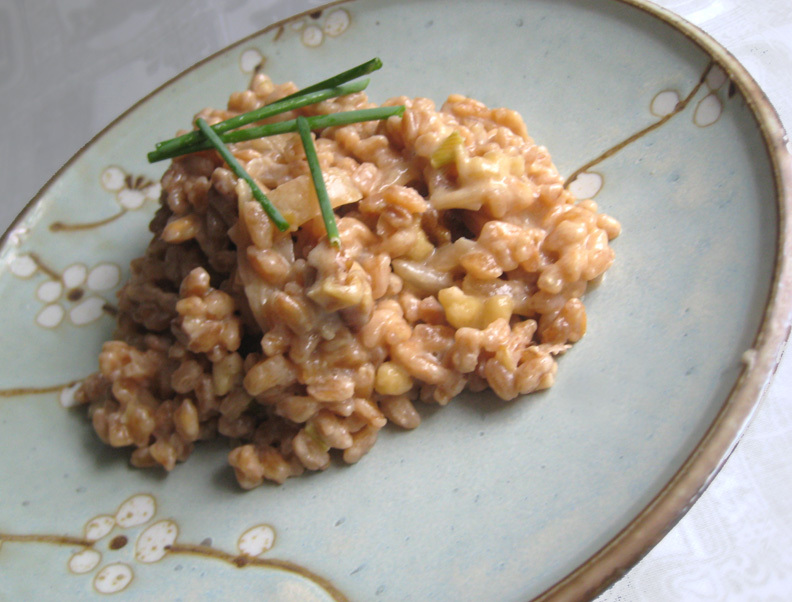 I fell in love with the pleasantly chewy texture of farro and vowed to recreate the dish at home. Despite being pretty gung-ho to make the risotto...err...farrotto...I put the stuff in the cabinet and forgot about it for several weeks, digging it out only recently to play with it. I wasn't sure how long it would take to cook the stuff - would making a farrotto take longer than a risotto made with rice? or steel cut oats? So I consulted the Google. Giada the Human Lollipop suggested soaking the farro in water for 30 minutes, which softened the stuff up nicely. After draining, the farro only needed about 2 cups of stock to make it tender enough to eat, but I used three. I used only onion and salt and pepper as seasonings, but that was adequate--the result was quite tasty. Next time though, I think I'll try adding some mushrooms. Here's a recipe of sorts...I don't think this sort of thing is rocket science, since I didn't measure anything and it came out fine. You might want to read it all the way through before you start cooking. Saute 1/2 cup chopped onion in 3 tablespoons of olive oil and a pinch of salt. That seems like a lot of oil, but once the onion has softened, toss in 1 cup of farro that has been soaked in 3 cups of water for 30 minutes and drained. Stir until the farro is coated with oil (add more if necessary) and starts to brown, 5 minutes or so. Meanwhile, have 3 cups of chicken stock warming in a saucepan nearby. When the farro is toasty, put in a cup of stock. Stir regularly until stock is mostly evaporated, then add another cup. Hell, put the rest in - it won't matter. Cook over medium heat until there's just a bit of moisture left, then put in a couple tablespoons of butter and a splash or two of cream (heavy, light, half-and-half - whatever you have). Cheese is nice, too - I added a half cup of shredded Muenster, because that's what I had. Stir until it's all nice and creamy, season with salt and pepper, and then eat. Right out of the pan, if that's what floats your boat.